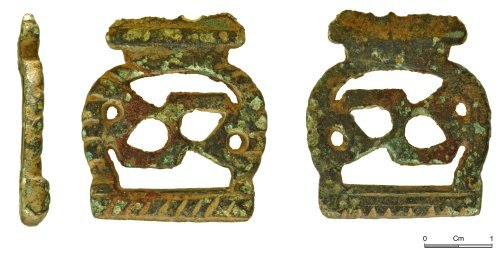 Copper alloy openwork probable strap-end, of late medieval date. The mount is incomplete, broken at one end and possibly also broken at the other (with a surviving length of 32.2mm and a weight of 10.7g). The wider end is straight and is the thickest surviving part of the mount (with a width of 25.1mm and a thickness of 4.2mm) and appears to be near-complete but is corroded. The end is decorated on both faces with diagonal incised marks; on the front face, the marks are cut through a rounded rib, while on the rear fewer marks are cut through the edge. The sides are convex (reaching a maximum width of 28.3mm where the mount has a thickness of 2.7mm) forming an openwork D-shaped panel. The edges are enhanced with notches and the interior contains a geometric design possibly representing a letter S in a gothic script and incorporating two circular holes at each end (of 2mm diameter), probably holes to accommodate attachment rivets. Beyond the D-shaped openwork panel, the mount narrows (to 15.4mm) before widening to a linear bar (21.3mm wide). The mount thins on both faces (to 1.0mm) beyond the bar, across which it has broken. See a comparable example in Egan in Griffiths et al. (2007, 139; pl. 24, no. 1621).